Please refer to our stock # FenEC2tdbt when inquiring. Fenton Glass Co. made this Emerald Crest tidbit from 1954-56. 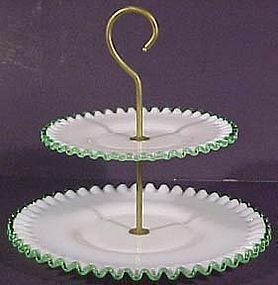 The 2-tier tidbit stands 11" tall including the handle. Bottom plate is 11-3/4" and top is 8.5" wide. In mint condition.